Take advantage of safe transportation this New Year’s Eve. 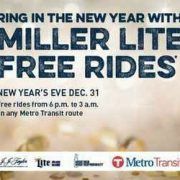 Miller Lite Free Rides will provide evening service to many popular destinations, including restaurants, bars, local events, and other neighborhood celebrations in the Twin Cites. 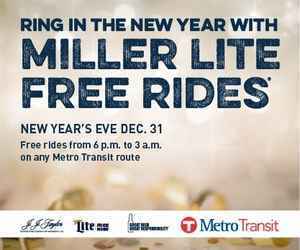 Miller Lite Free Rides will be available on all Metro Transit bus, light rail and commuter rail routes from 6 pm until 3am. Visit Metro Transit for detailed route information for New Year’s Eve.